Natural features are often equated with defects in leather or more precisely with shortcomings. Our leather draws the line at a point where the serviceability of the leather, or of the product employing the leather, is objectively affected. This means that if leather goods or furniture display holes or open scratches, it represents a product defect. Natural features do not reduce the functional quality of the product. The integral strength providing long performance is not compromised. 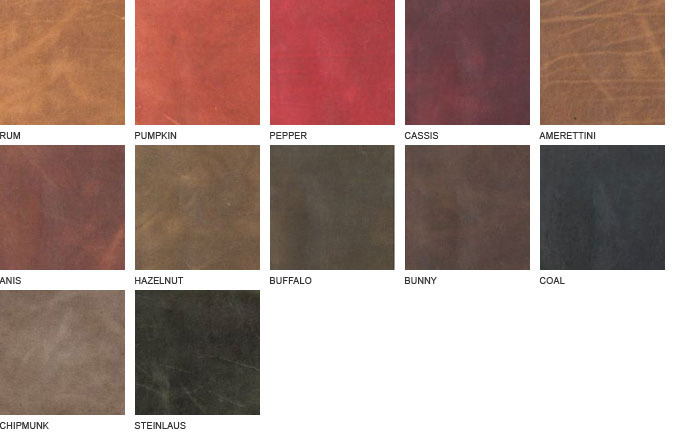 Since leather is a natural product, it is expected that the rawhides will display certain irregularities that are due to the life circumstances of the animals. • Leather orders may not be returned or canceled. • Please check the leather carefully upon receipt. Absolutely no claims can be accepted on goods that have been cut or altered in any way.